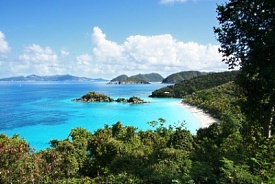 The gently rolling hills of this island blend with palm-lined beaches and turquoise waters. Old plantation windmills are scattered across the landscape, and the Danish heritage is evident in the towns of Frederiksted and Christiansted. Snorkelers will find their paradise at the nation's only underwater national park, Buck Island Reef. Other popular excursions include a rum-tasting tour of the Cruzan Rum Distillery, horseback riding in a rain forest and a sailboat ride.